Hydraulic pressure test kits are essential for light and heavy duty monitoring, construction excavation maintenance as well as emergency repair. They are designed for hydraulic fault-finding as well as reporting purposes- and are often employed by service technicians and machinery dealers across the world. Hydraulic testers help you to perform operational checks- specifically the ability to accurately assess oil flow, temperature, pressure and speedily single out poorly operating components. 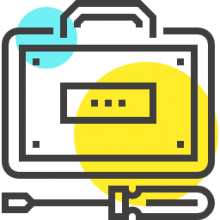 Users write that the return on investment is really high- if you manage to use it more than once, it is likely that it has paid for itself as a result of warranty claim reduction, helping you to replace faulty parts, which can result in a decrease in machine downtime. The 4.2 lb., Dusichin DUS-800 Hydraulic pressure test kit is a solid option that has a maximum working pressure of 9,000 PSI with three test hoses that are each 60" long, including 6 separate couplings. Let's take a look at five of the best-selling hydraulic pressure testing equipment kits. 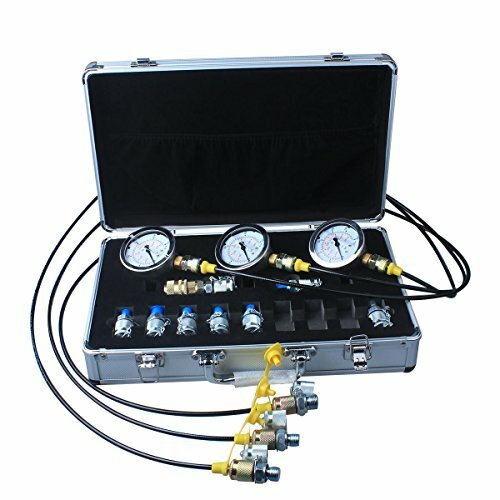 The Dusichin DUS-900 Excavator Hydraulic Pressure Test Kit has a variety of different features- including a maximum working pressure of 9,000PSI/600Bar/60MPa, three test hoses that are 60 inches long, three different pressure gauges, eleven couplings and ships in a nice aluminum case for easy storage and ease of travel. Many users recommend the nice compact case that this hydraulic pressure test kit has because it makes it easy to keep all the pieces together in an orderly manner- without having to look for any of the attachments they might need to use. A lot of reviewers have also commented on how they enjoy the quick release coupling and the quick connector B that is compatible with Caterpillar and John Deere products. Some buyers were impressed with the gauges since they use industry-standard fittings and can easily be upgraded or the set can be added to later on down the road. Only thing users didn’t seem to care for was the durability of the carry/storage case, some say it appears to be flimsy and may not last. The Dusichin DUS-800 Hydraulic Pressure Kit is a smaller version of the DUS-900. Even though it is smaller it still has nice features that many users enjoy. It has the same maximum working pressure as the DUS-900 hydraulic pressure test kit and it also comes with three different hoses and includes three different pressure gauges. 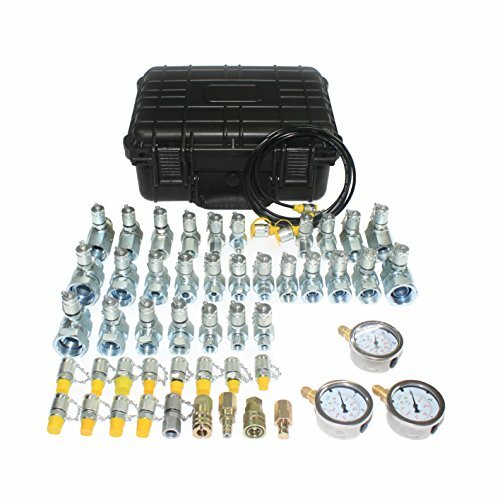 The main difference in this hydraulic pressure test kit is that it only comes with 6 couplings and not 11 couplings like the DUS-900. Most who have used this hydraulic pressure test kit find that it is of really good quality which was unexpected since the price is relatively lower compared to other models on the market. Some users have discovered that there is a 10000 PSI gauge that comes with this unit but it doesn’t fit anything in the kit so there is no use for the 10000 PSI gauge since nothing in the kit fits it. The storage case may not be as attractive looking as the DUS-900 but some users think it appears to be sturdier because it’s not made of aluminum but of steel. The 6 Test Point Hydraulic Pressure Kit is a hydraulic test kit that some buyers endorse for hobbyists who like to do things themselves in their own garage or basement shop. 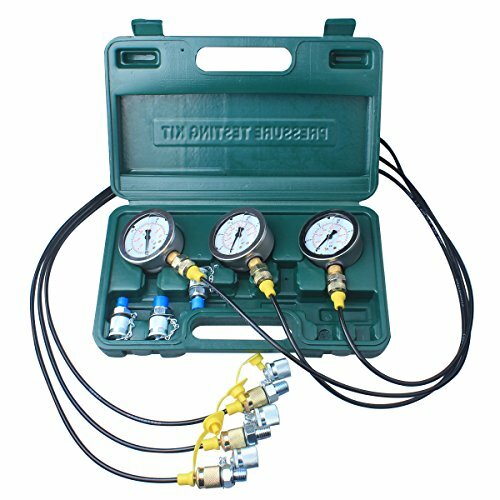 Even though it is a small hydraulic pressure test kit it still has some nice features such as three different pressure gauges that are 63mm/25MPa. It also comes with 3 different hoses and 8 different gauges that are all pretty easy to use. Some users liked the sleek design of the carry/storage case which is a nice red with silver trim and appears to be durable and sturdy. Although this is a nice little hydraulic pressure test kit, it may not be something that users would want for professional, on-the-job use. The XZT Hydraulic Pressure Tester Coupling Kit is primarily designed for excavator construction machinery is feature-packed and is suitable for professional users, but easy enough to use for hobbyists to use in their own private shop or garage at home. 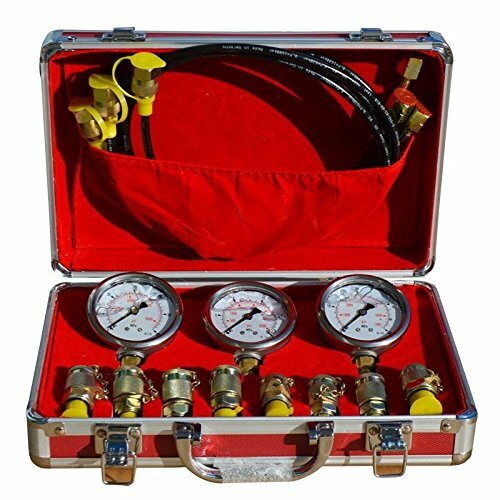 It comes with a high quality and durable carry case that is extremely easy to carry and to store and is well padded on the inside to protect all the pieces of this hydraulic pressure test kit. It comes with a lot of industrial-quality pieces that are suited for most any brand of excavator. Most buyers endorsed its maximum working pressure of 9000PSI/600BAR and its three gauges that range from 3600PSI/250BAR to 9000PSI/600BAR. It also comes with 13 different test couplings, has quick release coupling along with quick adapters for Catpelier/CASE-(BSP1/8F), Komatsu/Hitachi-(BSP1/8F), Volvo-(BSP1/8F), Sumsung-(BSP1/8F) and Daewoo/Kawasaki-(BSP1/8F). Not only does this kit include these adapters it is also equipped with 29 swivel run tees. The only thing that seems to be lacking here with this hydraulic pressure test kit is that it only comes with one test hose. The Point Coupling Max Work Pressure Hydraulic Pressure Test Kit is a decent option that may not be suitable for the workplace, but could be useful for hobbyists who need a hydraulic pressure test kit in their home garage or home workshop. It comes with three different pressures gauges that are 63mm/25MPa, 63mm/40MPa and 63mm/60MPa. It comes with one test hose that is 1500mm in length which should work for a home workshop with no issues. It also has eight different test couplings that come in sizes G1/8, G1/4, G3/8, M24*1.5, M10*1.25, M10*1, UNF7/16-20 and UNF9/16-18. The box that it comes in is a nice looking storage/carry case that is red with silver trim, makes it easy to carry and to store away in tight places. If you are looking for quality hydraulic pressure testing equipment, You might be looking to assess pump flow as compared to its rated output, conducting pressure checks on relief valves to ensure their proper operation and closed-center systems, as well as isolating component leakage. Purchasing a hydraulic tester is a great way to perform system test diagnoses as well as relief valve diagnoses in a comprehensive and accurate way. If you are looking to purchase one of these hydraulic pressure test kits-check out our comparison table at the top of the page and also examine some of our individual product reviews to get a sense of the best options on the market today.